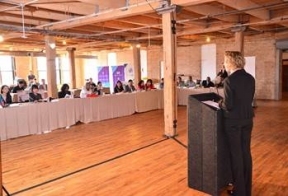 On Tuesday, April 14, Chicagoland community media was invited to the 3rd Annual Multicultural Media Roundtable Luncheon hosted by ComEd at the Lacuna Artists Loft Studios, located in the Pilsen neighborhood. Local media and influencers had the opportunity to sit down with top ComEd leaders to discuss the company’s latest innovations, technologies, community partnerships, and experience ComEd innovation first-hand via a variety of live exhibits. This was a fantastic opportunity for ComEd leaders and media alike to join together and discuss the importance of getting involved collectively and learn to lead change within the city.